You applied to 100 jobs but only got a couple of responses? My resume was done professionally and looks great. I am applying to jobs that I have the skills to be considered. So, what is wrong? Why am I not getting interviews? 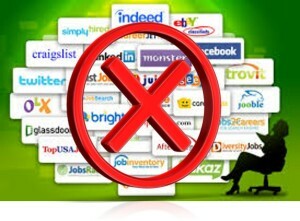 Because of the internet almost all job searching and candidate sourcing is now done online. In many way’s this is a great thing. With the advent of Monster.com, Indeed and thousands of other specialized job boards finding a listing of a job that fits what you do is easier than ever. But unfortunately, because of this, it is also just as easy for everyone else. The amount of people applying for jobs online these days can be hundreds or even in some cases thousands of applicants. To handle the huge number of applicants, more and more companies are using applicant tracking systems. With so many people applying for jobs online, applicant tracking systems screen candidates by criteria before anyone ever physically sees their resume. I have known job seekers who have sent several hundred resumes to online applications to just get one face to face interview. Guerilla Marketing! You need to bypass the applicant tracking systems or even the gatekeepers between you and the person who could be your next boss and apply directly to them. Find out who the hiring manager or boss who is hiring for the job. Reach out to hiring managers in companies that do not have jobs listed but you would be interested in. Often jobs are not posted because they are looking to replace someone or are not necessarily looking but could be if the right person comes along.